Play therapy as a profession is maturing in counties such as Canada and the USA, growing at a fast pace in Ireland and the United Kingdom and starting to emerge in many other countries. A few countries have enacted legislation that requires the use of play therapy to fulfil their obligations to children. As a result a number of potentially unsafe and ineffective practices are springing up that may damage the reputation of play therapy. Some countries and states are moving, often uncertainly, towards regulation through registration by title 'Play Therapist' or other forms of licensure. There has been an explosion in play therapy related publishing some of which may lead to confusion. It is necessary to constantly review exactly what standards are required for safe and effective play therapy practice in each country. Although version 2 of the PTI Competency Framework was the most comprehensive set of play therapy standards in the world, it was decided to undertake a major revision in the Autumn of 2006 to produce version 3 of the PTI Competency Framework to bring it up to date. Play Therapy International together with (IBECPT), mainly through the pioneering efforts of Dr Mark Barnes, set the world's first standards for training and practice back in the 1980s. It is an honour to be able to continue his work. We hope that these pages will be a useful source of reference for policy makers, administrators, commissioners and trainers working in children's education, welfare and mental health as well as existing and future play therapists and supervisors. PTI standards are based upon a systemic view of the processes involved in the safe and effective practice of play therapy. We then constructed a database containing 780 standards set or proposed by 9 other organisations in the play therapy and adult mental health field. This enabled us to carry out a comparative review and in some cases update our existing framework. The PTUK systemic model of play therapy practice shows the context for setting standards and the central role of competencies. Safe and effective practice must be based primarily on the needs of the children coupled with the needs of the organisation or agency (school, social services, primary care trust, adoption, parents, carers etc) commissioning the service. The practitioner needs to be trained to the highest possible standards based on well defined competencies and have suitable personal qualities and attributes. Play therapy needs to be conducted in a safe and appropriate environment. These factors are generic for all countries. Practice has to be constrained within statutory requirements and standards and an ethical system. These will vary from country to country but needs to be a part of the training. A play therapist needs to be supported and monitored through clinical supervision. It is also important that practitioners have support from a national professional organisation such as PTUK, PTIrl, PTFr, PTEsp or from an established international organisation, such as Play Therapy International (PTI) where a national organisation does not yet exist. 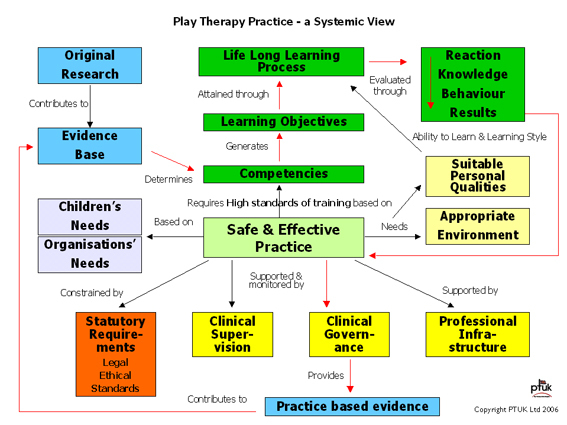 Both practice and the competencies on which the training is based must be founded on a sound play therapy evidence base. A flexible method is needed to ensure that the competencies meet the practice needs of the client group, organisation and country efficiently, taking account of culture, ethnic factors, the resources available and baselines. Learning objectives to meet the needs of the practitioner and organisation should then be derived from an agreed catalogue of competencies and their related behaviour indicators (explained below in detail). The learning objectives are attained through a life-long learning process that must be evaluated on at least four levels. The system shown in the model contains a closed loop. The results obtained in practice after training are measured through clinical governance procedures, used to provide practice based evidence which in turn contributes to the evidence base used for practice and training. It may be concluded that play therapy standards are required for different purposes. These include public safety, proficiency of practice, the development and evaluation of training programmes, performance assessment, remuneration decisions and career progression. Standards must take into account all of these functions. This article is mainly based on a comparative evaluation of four approaches by different organisations, to play therapy standards. Our review incorporates the competencies required and an examined the different methods used to evaluate the learning processes. There's no point in setting standards unless they can be implemented in practice and directly linked to learning. The purpose of using levels in a competency framework is to provide the amount of specific detail that is required for a particular use. A framework with three levels has more granularity than one with only one level and is more capable of being applied effectively. The greater the granularity the greater the effectiveness. (3) Behaviour indicators - a description in specific actionable and measurable terms of how the proficiency in a competence of a practitioner may be determined. The number of items in each level rises considerably together with the amount of work required to define them. It is our view that a competency framework without behaviour indicators is too general to be applied effectively. The PTI competency framework has now grown to 207 defined competencies as a result of this latest review including filial play coaching/mentoring. At the next level, it has taken three years to define 797 behaviour indicators. It could be reasonably argued that the definition of learning objectives is the job of the training provider. However at present training providers often set these on the basis of what their faculty can teach within the general area of play therapy rather than what the profession needs. The PTI course accreditation process now requires that the learning objectives of the programme are mapped to at least level 2 and ideally to level 3. A major aim of standards setting is to ensure consistency of training. This will not happen until play therapy training providers provide content to an accepted standard of competencies and behaviour indicators. 'Competency' seems to be a word whose original meaning is gradually being debased through its increasingly popular use. A similar example is 'feedback' which is now commonly used to describe just the process of getting information that results from some action whereas the original meaning focused on taking corrective action based upon analysing the information received. As evidence of the confusion a professional organisation recently defined competencies as personal qualities. Sometimes there is also confusion between 'competence' and 'competency'. We are using the term 'Competence' as an ability based on work tasks or job outputs eg 'Able to give a preamble to a child about to use a sand tray' and the term 'Competency' as an ability based on behaviour eg 'Sets the boundaries for a sandplay session prior to starting'. In practice many frameworks blend both together and this is how PTUK & PTI have proceeded. Private and public sector organisations have been developing and using competencies and competency frameworks for about 30 years. Originally competency based criteria were developed for very specific applications - one set for designing training programmes, another as a basis for remuneration scale grading etc. rather as PTUK had first conceived the Play Continuum as a communications tool. However it was soon realised that a competency framework could be applied across a full range of human resource processes. Our belief some years ago that it should be extended to a full range of professional processes is gradually coming true. (1) The basis of a common (international) language for describing the effectiveness of its members both internally to the profession and even more importantly externally to its clients and other 'customers'. (2) An opportunity to achieve a high level of consistency when measuring quality of service and assessment of performance. PTI believes that 'quality management' perhaps better expressed as 'clinical governance' is fundamental to play and creative arts therapies. It is as important as safety and indeed complete safety cannot exist without clinical governance. Although outcome measures are paramount in clinical governance they are not always obtainable and therefore it is our view that activities, which are capable of being observed, should be compared to agreed standards - a competency framework. A competency is then given one or more behavioural indicators. These are the basic building blocks of the framework. They are examples of behaviour that may be observed when someone demonstrates competency. Because the framework will have to cover a wide range of working situations (note we are not using the term 'job' at this point) with different degrees of demands the behavioural indicators will normally be graded. For example the competence 'Working with Information - Gathering and analysing information' would have different levels for a work situation requiring therapeutic play skills as compared to that of a manager and clinical supervisor of highly experienced play therapists.